Many of the planets discovered elsewhere in our galaxy are not like Earth, but rather more like Jupiter. Such gas giants, as far as we know, are not hospitable to life, but now it has been suggested that the moons of these planets could be habitable. If confirmed, it would suggest these locations could be the predominant sources for life in the universe, not worlds like our own Earth. ‘If even some of these Jupiter-sized planets have moons, they might be the predominant sites of life in the universe,’ Dr Sarah Ballard said. In particular, she focused on the world of Upsilon Andromedae d, a gas giant exoplanet about 10 times the mass of Jupiter, located 44 light-years from Earth. 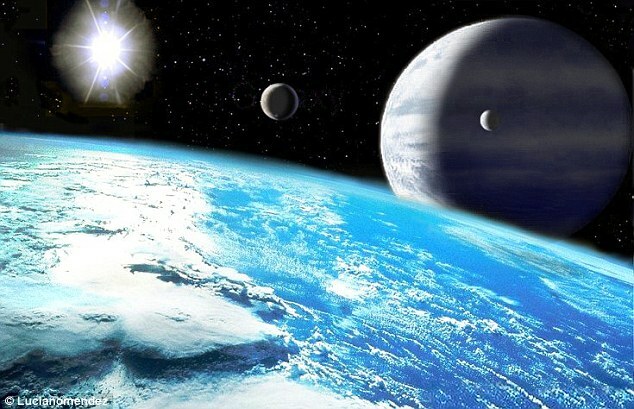 While the planet itself is not thought to be habitable, it is possible that a moon in its orbit - known as an exomoon - could be. And if you were to step on the surface of the moon, you would see ‘beautiful tumultuous clouds on the Jovian planet’ and ‘incredibly complex cloud activity,’ according to Dr Ballard. So far, no exomoons have been discovered, but given that six of the eight planets in our solar system have moons, most astronomers regard it as an inevitability rather than a possibility that one will be found. It might be possible to find one in data collected by Nasa’s Kepler space telescope, or it may be necessary to wait for a more powerful planet-hunter to come online, such as the Transiting Exoplanet Survey Satellite (Tess), due to launch in 2017. Finding exomoons is a bit of a problem though, as their mass and size is so much less than their host planet. One technique to find them that may prove successful is gravitational microlensing, which uses a foreground star to magnify a more distant one. The chance alignment can reveal exoplanets around a star, and could possibly even be used to spot a moon in orbit. And we are able to rule certain planets out - ones that are too close to their host star, like Mercury and Venus in our own solar system, are unable to cling on to natural satellites. But finding out if moons are common in our galaxy will be key for the search for life, and could signal a change in goals for planet-hunters in the near future. ‘The fact we reside on a single rocky hunk of rock, orbiting without a big brother planet, might be relatively unusual,’ added Dr Ballard.